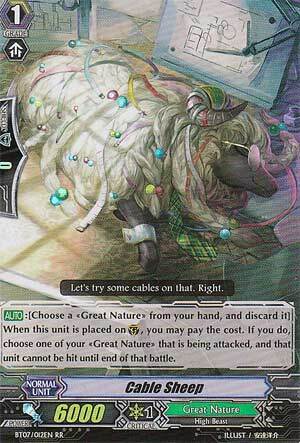 [AUTO]:[Choose a «Great Nature» from your hand, and discard it] When this unit is placed on (GC), you may pay the cost. If you do, choose one of your «Great Nature» that is being attacked, and that unit cannot be hit until end of that battle. ...if anyone reads my reviviews, they already know what I'm going to rate Sentinel units seeing how, personally, they are essential to any deck regardless of Clan, and Great Nature's Cable Sheep is no exception. Next Time: How can fire be a breeze??? ...I don't think there's anything intelligent to say about Perfect Guards. Limit Break skills that gain a ton of power and Critical are everywhere. It's not practical to throw away a ton of cards every turn to block them. So you run 4 PGs if you're monoclan.